There are nightmarish job interviews, and then there’s the suited hellscape depicted in Catalan playwright Jordi Galceran’s 2005 play. 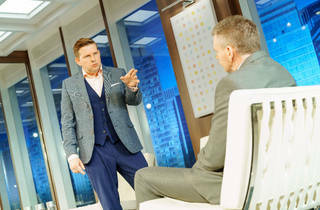 ‘The Grönholm Method’ has been translated and performed in over 60 countries and on the basis of the Menier’s smart production, it’s easy to see why: it mixes adept satire of twenty-first-century corporate horrors with the twisty-turny energy of classic potboiler thrillers like West End stalwart ‘The Mousetrap’. 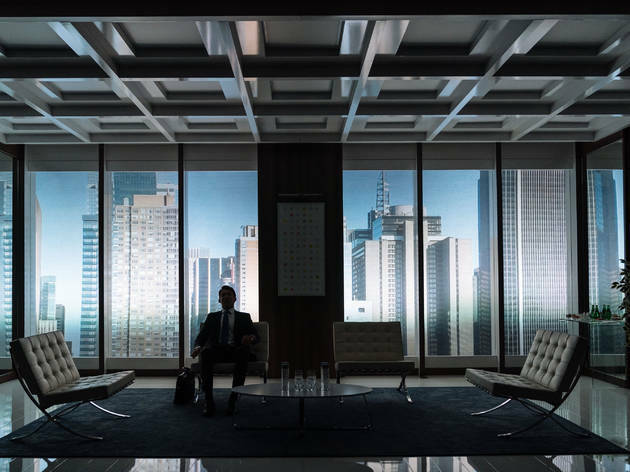 It follows four people trapped in a boardroom, all fighting for the same job. Anne García-Romero and Mark St Germain’s translation makes the New York setting feel totally plausible, with bland management speak mixed with hokum stories of their lives back home. And a strong cast makes mincemeat of all the challenges that Galceran’s story throws at them. John Gordon Sinclair plays Rick, a blustering hick with a pocket full of Tic Tacs. 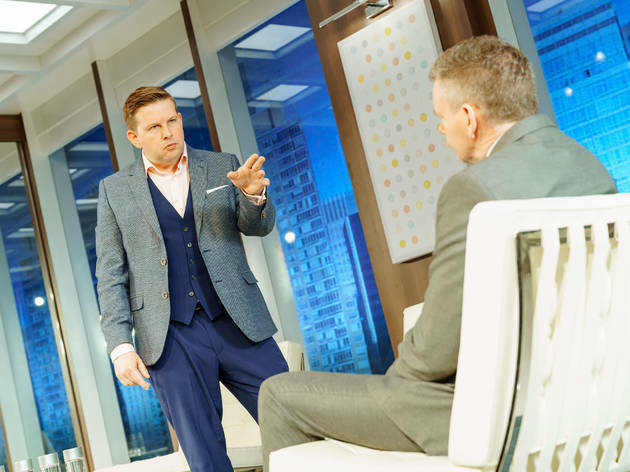 Jonathan Cake’s mercurial psychopath Frank is ready to eat him for breakfast. Greg McHugh is Carl, a pink-faced Ivy League grad who makes an unexpected plea for acceptance. And chucked in amongst the blokes is Laura Pitt-Pulford as Melanie, the lone woman who’s very much aware of it, and is constantly battling to maintain her steely facade. 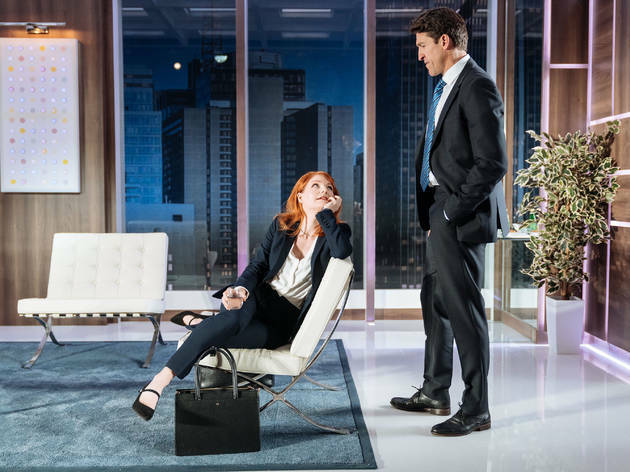 ‘The Grönholm Method’ is basically a satire of corporate recruitment: the lies it forces people into, the hunger it induces and asks for, the farcical, dehumanising emphasis on profit over potentially costly personality. It wheels on differences from the supposed norm – especially trans identity – only to use them as elaborate tests to extract would-be-hilarious rants from the characters. 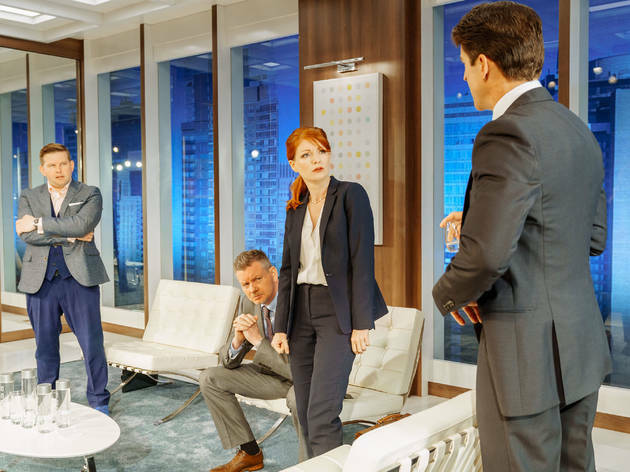 The play doesn’t show any genuine interest in what not fitting the corporate mould means, nor the impact of valuing people only according to how closely they can impersonate a white male corporate cyborg. Here, New York business culture is just a game, which these four archetypes are all more or less successful at playing. 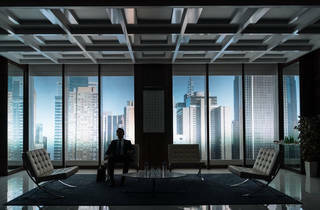 As the interview wears on, this boardroom becomes a box of tricks, ready to spring increasingly nasty, psychologically intense surprises on its victims. With a play that’s this tightly crafted, the lack of flesh under their suits almost doesn’t matter. I really enjoyed this play and it’s got to be one of the cleverest plays I’ve seen in a long time. Imagine a corporate interview with a difference which will keep the audience guessing right until the very end. Expect surprising psychological scenarios and tongue in cheek humour. It really makes you wonder about the lengths some people will go to, to secure that elusive top job whether it involves a fabrication of lies and deceit, forgoing empathy and acceptance of others. 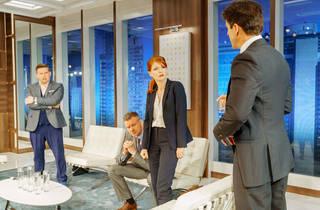 I thought the small cast were truly excellent and they captured my attention throughout and it’s a play that certainly makes you think.